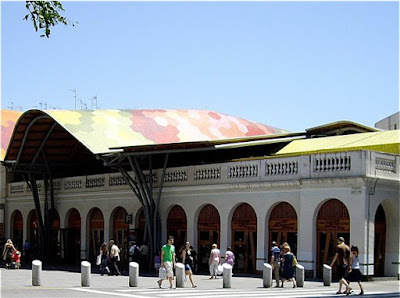 Merkat Santa Catharina is the second large food market in Barcelona city centre. It is less rustic than the famous food market by Las Ramblas, but is by no means less interesting. 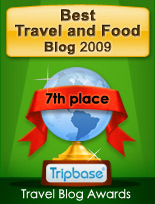 I was captivated by the selection of fresh seafood, and found a selection of frozen goods I would have loved to try. Fresh seafood is by no means the best, but modern freezing techniques have provided frozen products of increasingly higher quality. 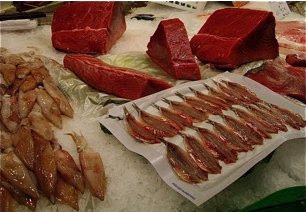 At Merkat Santa Catharina there were are wide range of different seafood products offered. Fresh, salted, marinated in oil or frozen. You can easily loose track of all the different species of fat fish harvested in the Mediterranean. These neatly vacuum packet small fish shine like silver, suggesting that they may be anchovies or a related species. Healthy, as they are full of good unsaturated oils, preventing high cholesterol and subsequent cardiac arrest. I am so envious of Catalan consumers that may buy tuna fish as fresh as this on their local markets. 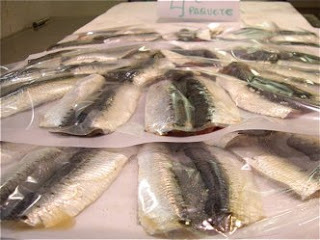 Here they are displayed with smoked or possibly salted herrings and squid. Waste not, want not. When I was a kid, schools of small fish used to roam around in the fjord where we had our summer cabin. When we caught any, we used to use them as bait to catch bigger fish. As I visited Barcelona for the first time, I and my friend Laila ordered something called "salmonetes", in our local restaurant. Believing we would get a salmon dish, we discovered that it were small fish, simply tossed in flour and fried in olive oil with head, guts and all. If you want something more substantial as a meal you can also buy Chipirones limpios, frozen baby squid. 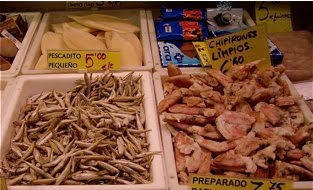 Here they are sold as pesquaditos, and I enjoyed a bowl of this fried small fish in Barcelona this summer. See story here. Often you buy a package of frozen mixed seafood, use a little, then disappearing in your freezer. I would so much prefer to buy the exact amount for my purpose. Here is a mix of different mussels, crustaceans and fish to be used as ingredients in a Sopa de Pescado , a delicious soup or a special mix for a Salpicón de Marisco. A salpicón may be a refreshing mixture of chopped vegetables, fish and/or chicken, generally seved cold as appetizers. This dish is very popular in Hispanic culture. Here you are also offered mixed frozen ingredients for a rice salad with pineapple. Spaniards love their salteado des espinacas - spinach fried in oil with garlic. 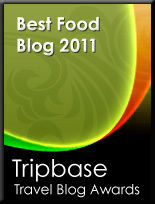 It may be served as a starter or as main dish. There are two salteado mixed offered here. 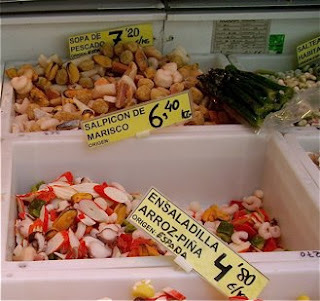 In the front you can buy frozen spinach mixed with prawns, to be prepared in your skillet. 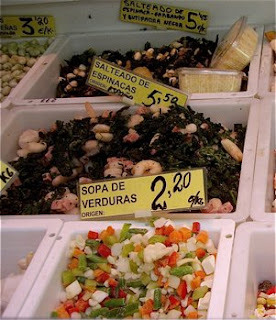 You may also choose to go vegetarian, buying frozen ingredients for a tasty sopa de verduras - a vegetable soup.